Railpictures.ca - Paul Santos Photo: A collection of about 35 cooling/DB blower fans make up this “Field of Fans”, that would be the total removed from 7 SD40-2 models (3 cooling & 2 Dynamic Braking per unit) They were shipped out the next day for refurbishing. | Railpictures.ca – Canadian Railway Photography – photographie ferroviaire Canadienne. 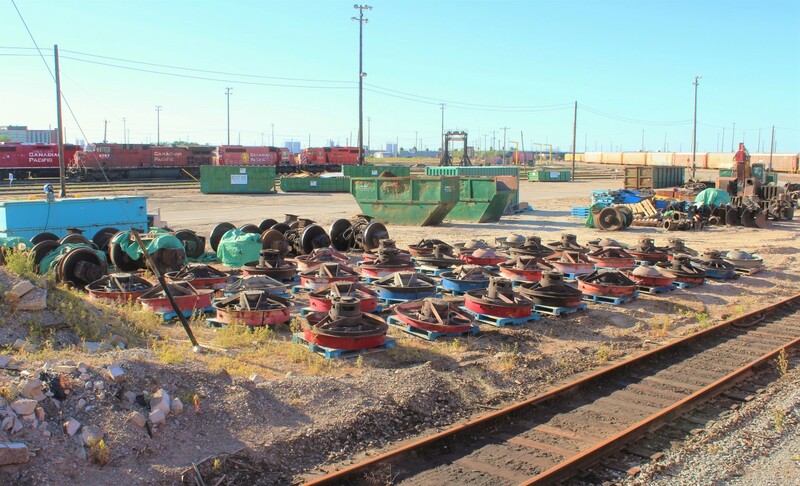 Caption: A collection of about 35 cooling/DB blower fans make up this "Field of Fans", that would be the total removed from 7 SD40-2 models (3 cooling & 2 Dynamic Braking per unit) They were shipped out the next day for refurbishing. The wheelsets/traction motor combos will be refurbished as well. Not many components of a scrapped unit actually get shredded. I love the fact that it’s all nice and neat on pallets/skids. What about the wheelsets in the back? Same destination?